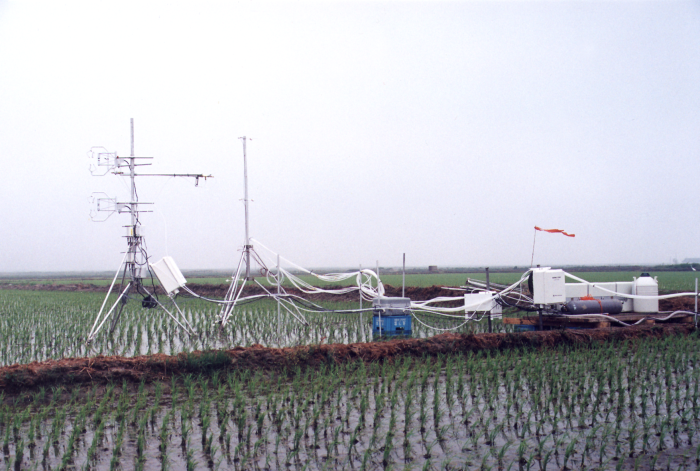 With instrumentation and help from Campbell Scientific, personnel from the Department of Atmospheric Sciences at Yonsei University, Seoul, Korea, measured greenhouse gas fluxes over a rice paddy in the summer of 1999. Campbell Scientific provided three systems to make the measurements: a methane/carbon dioxide/water vapor eddy-covariance system, a methane profile system, and a carbon dioxide/water vapor profile system. Instrumentation used in the systems included TGA100 Trace-Gas Analyzers, CSAT3 Sonic Anemometers, dataloggers (CR9000 and CR23X), hygrometers, and LI-COR 6262 H2O/CO2 analyzers.